You must make reservations at least 5 minutes in advance of the time at Urbana Dining & Drinks. 7 Days a Week: 3:00PM - 7:00PM. Monday-Friday happy hour from 3pm-7pm. Featuring a wide array of beverage options, including craft cocktails and assorted beers and wines, our menu has something for every taste. Our kitchen features $1 oysters, a raw bar and appetizing bar snacks in the Italian tradition. We know you want your DC event to wow, whether it’s a splashy wedding bash, a campaign fundraiser or just an intimate get-together with friends. At Urbana, our sleek décor provides a modern, comfortable setting for your unforgettable Dupont Circle event. We can accommodate everything from the smallest events to restaurant buyouts for up to 200 guests. Our secret ingredient is Chef Ethan McKee, who oversees Urbana’s original, taste-tempting menu of light, fresh dishes inspired by the Italian coast. For more info about special events at Urbana, contact Amber Wright or call 202-448-1877. Located in the heart of Dupont Circle, Urbana Dining & Drinks imports the flavors and culinary craftsmanship of Italy to DC’s most cosmopolitan neighborhood. You’re in the capable hands of our stellar team, as our neighborhood bartenders craft you a thoughtful happy-hour cocktail and Chef Ethan tempts your taste buds with his house-made artisan pastas, inspired vegetable dishes and local seafood delicacies. It's a restaurant in a hotel. Ate there several times, food is good service is spotty. This was a great experience. I went for brunch with a friend. 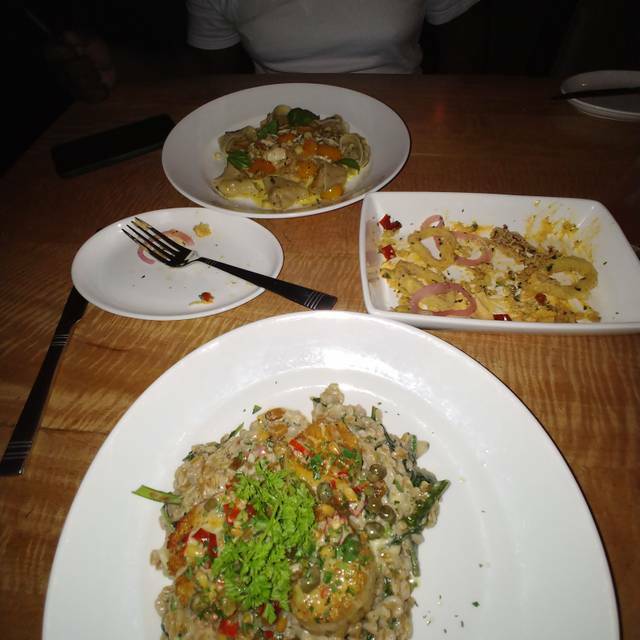 The food was awesome and service was even better. I will be back! The service was fantastic. No complaints there. The dish I had was terrible. It was the pasta with homemade lamb sausage and fava beans. Quite simply, it made me physically ill and ruined the rest of the evening. It was also a taste abomination. The pasta itself tasted as if a first year dorm freshman was following a recipe he did not understand. The sausage bits were fine by themselves as were the fava beans, if a bit salty. The somewhat aged mint was coarse and did not complement. The parmesan was waxy and uninteresting. At the bottom of the dish was a watery substance, and that's all I can say for it. Breakfast on the same day was fine. I would do breakfast at the restaurant while staying at the hotel again. But not dinner. No. Good selection of entrees and appetizers. Helpful staff. A bit noisy but a good vibe. Service was warm and kind, but somewhat inattentive. Bucatini, excellent. Cocktails excellent. Service excellent. 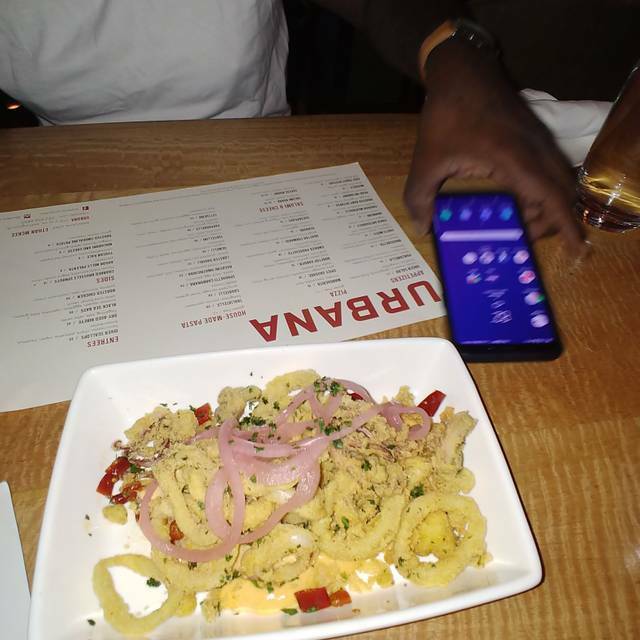 The is a good Dupont Circle dining spot that just works so well for an after work drink, a quick bite at the bar, a comfortable meal or a gathering. Tonight's meal was great, pesto bread, lamb shank - wonderful, and fillet steak with a side of brussel sprouts. A great meal, beautifully cooked, well proportioned and great service. Of course, we will revisit! I went to Urbana for weekend brunch. This was my first time there and I was pleasantly surprised. Really cute spot with great food and drink specials!! LOL. I will definitely go back again! This restaurant and the experience were awesome.I went there for brunch for my girlfriends birthday and we had a blast . The price for their bottomless mimosas’s is the best I’ve seen in the city. The food was good. I would have liked a little more variety for the menu but regardless it was delicious. Service was amazing and everyone was very friendly. Cute place and the ambiance was great. I will most certainly be returning. Service terrific. Raina our waitperson was excellent. Food and service were both fantastic!! I hadn't been to urbana in a while but my friend really wanted to try their brunch. Their bottomless drink specials are a good deal, but the service is awful and the food is average and at times subpar. We got the pizza, eggs benedict, and burger. It was all mediocre. I can think of many other places in DC to get a better brunch with better service and equally if not better value. Our waiter was no where to be found for basic things. I think the hostess ended up waiting on us more than our waiter. I shouldn't have to spend half of brunch frantically looking for someone to bring basic things like a glass, refills, or condiments. Also, the place was pretty much empty so there really wasn't any obvious reason why our waiter was so MIA. Two tables from us, a man was passed out from being intoxicated and over served. I ordered a pesto pasta dish and I found a plastic cap in my food. Overall, extremely disappointed. I felt bad that the manager had to deal with so much. Recently went for brunch on Saturday with a group of 8 friends. Wasn’t concerned since I have been many times for brunch and service and food has always been outstanding. The restaurant never got busy from our arrival at 1230 to our departure at 1500. Sandra was super nice however, for the restaurant to have been so slow we expected her to check in a bit more. Everyone stated the same regarding the food, unseasoned and not flavor-able, cold. The only item that was enjoyed was a salad and a burger. The bottomless bottles for brunch is a great steal! But they were never cold and to track Sandra down for another bottle once one was finished as another pain. Super disappointed with service and food cause everyone was looking forward to the experience. Quality doesn’t match the price. The poached eggs on the Benedict were over boiled, not runny. The Calzone Americano was mostly air, barely stuffed, and with excessive amount of crust on the edge. Like you ordered two extra breadsticks. The fried chicken was $18 and did not have a side. The sausage and peppers was good but too small for how expensive it was. All of it was overpriced for was it was. The only thing on point was the bottomless Bellinis that were delicious. It was good but we won’t come back and can’t recommend it to our friends. Awful, we never really had an experience as our reservation was for 10:15, they serve breakfast till 10:30, and yet when we walked in at 10 o’clock they told us they stopped serving breakfast, even though we had a reservation and they decided to close early. We will never go back again. Booked hotel room for a night followed by surprise bday party for my wife. Food was amazing and service was kind, attentive and warm. Went to Urbana for Sunday Brunch. It was OK, but not memorable. The best thing was the authentic "spaghetti" carbonara. I put "spaghetti" in quotes because when we ordered it from the menu we were told at first that it wasn't available because they had run out of spaghetti! Almost unbelievable for an Italian restaurant... However, when we expressed disappointment, the chef found some spaghettini - and the dish turned out to be excellent. Service and ambience could only be described as all right, but could do better. I won't put this on a list of restaurants to visit again. The pasta dishes are very expensive! Really nice place. Food tastes so good. Food was delicious (although overpriced) but we had the worst service. There were only two other parties in the whole restaurant when we arrived but it took at least three minutes before we were greeted. Our waiter knew nothing about the menu and completely forgot about a cocktail we ordered, even though we watched him write down a note about the spirit. He seemed genuinely perplexed by the steps of service. We never received water refills. When we finally were able to wave him down to get the check, he managed to mess up splitting the check between two couples. We received a check for one person, and a check for the other three. Thankfully the forgotten cocktail wasn't on either. Nice atmosphere but service was inattentive. Not happy with our experience. We made a reservation and when we got there they said all tables were taken for a private party, so they put us at a cramped table in the noisy bar area near the kitchen door. Food was delicious. But service was slow and inattentive. Needed to ask for water to be filled several times. If you charge this much for dinner, your waitstaff ought to be attentive. Especially when it wasn’t that busy. We have eaten here in the past and when we met friend’s suggested it even though we were not staying at the hotel. We were all pleased with the very well prepared food and generous portions. Our waiter was excellent on a very busy day. The pizza is not good. Go for the pastas instead! The food was okay but not much better than that. The service was pleasant and timely. The bathrooms were filthy and this makes me queasy about the restaurant. Even though it is attached to a hotel and shares bathrooms with it, there is no excuse for a place which serves food to the public to have dirty bathrooms. I was having an early birthday dinner with my mom and it was delicious! We had a great experience here, the service was quick and friendly. Stayed at the Hotel Palomar (sat-sun). On Sunday before checking out we had breakfast at Urbana since it was connected. It was very low key, but was very good. My mom had the 2 eggs your way, and I had the omelette. Both came we with potatoes and toast. Personally, I would have liked a larger portion of the potatoes but the omelette was delish! The server was super friendly, and efficient. He was super slammed but it didnt let it effect his service. Seated upon entry. Excellent decor of dark wood walls accented by unique lamps and glass artwork. I enjoyed the bruschetta, diver scallops and for dessert warm peach pie with mixed berries and ginger ice cream. Everything exceeded my expectations. In fact, the farro served with the scallops was the highlight of the evening. It could have been a meal of it's own. The service was acceptable although lacking near the end when I had to ask for the check. Overall I would return if the opportunity is presented and would not hesitate to recommend a visit by friends or colleagues. The food was really good. Service was not acceptable. Long waits, had to ask for almost everything, bread, napkins, knife. The one waiter who served us was friendly and pleasant, but completely overwhelmed. Tables at our left and right had similar experiences. There were lots of people running around, but perhaps they ought to review how they deploy the staff. A creative chef who needs better back up out front. Overall underwhelming italian-esque food. would not recommend. I dined during restaurant week. I was not offered their promo menu so I ordered from their normal menu. When it arrived, the calamari appetizer was cold. 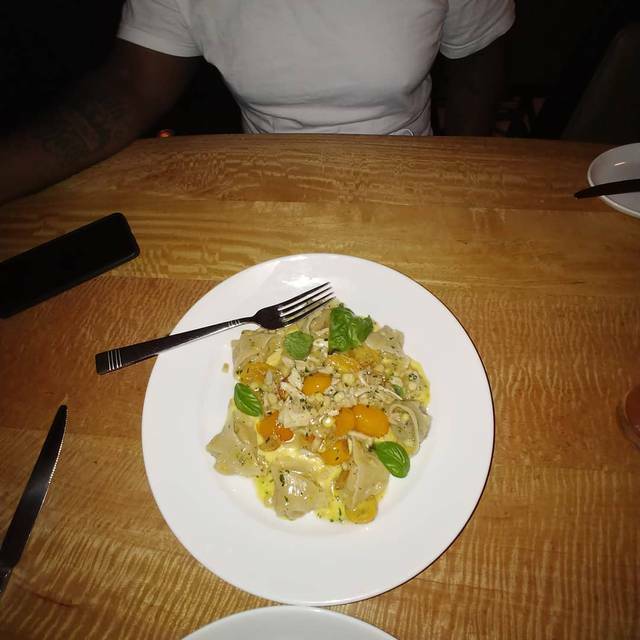 I ordered their pasta with lamb sausage entree. I love lamb but, this dish was way too salty. I took two bites and had to stop. A young girl was seated beside me and talked loudly on her cell phone the entire time I was there. The service was second rate. It seemed as though no one there knew how to operate a restaurant. My experience was totally unsatisfactory. I can’t recommend Urbana nor will I return. The service was terrible!! The dessert tart still had plastic on it when it arrived. Food was good. 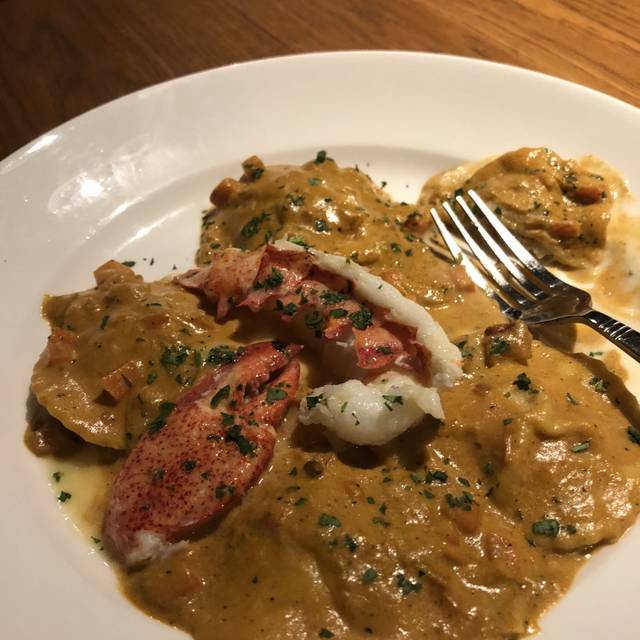 I loved this restaurant my first time there and I wasnt a guest at the hotel Palomar, I was a guest of Embassay Row and I couldnt stop telling people to come check them out. Cocktails and food was so delicious. Easy to make a reservation the wait for the food was minimal,came out hot and ready to eat. The manager also made it a point to check on us through out the meal and even recieved a piece of complimentary cheescake which was the bomb also. Will defiantly be back.